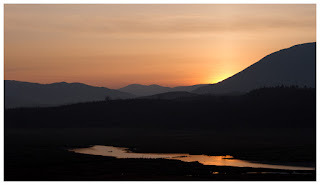 Following my recent decision to walk away from my career in IT, at least for a while, and concentrate on my photography, I find myself in a position to be able to do what I want and when. 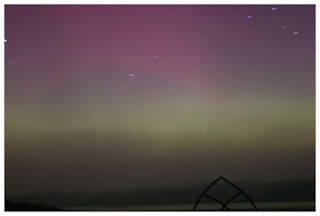 As such, Mull was top of the list (as usual!) 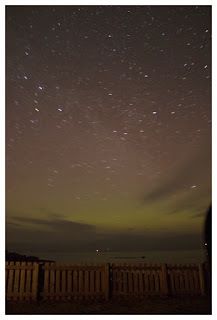 and after a bit of planning, I had arranged to stay there for a week mid-March, with the intention of heading further north to the Highlands for a second week. 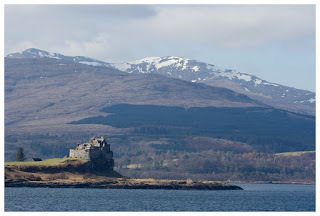 Not having been to Mull in March before, I was expecting the weather to be a bit well, wintery and for me to have to rediscover where the wildlife would be, at that time of year. After a very wet journey up to Oban, I was relieved to see the skies clear on arrival, and as before, I was able to sit outside a quayside bar and enjoy an ale in the sunshine, whilst planning targets on the isle. 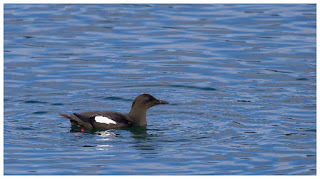 Breakfast, shopping and a brief walk around the ferry terminal, including watching a black guillemot fishing in the sea, and I found myself stood looking at the snow-capped peaks of Mull, surprisingly from the deck, with it being calm and not too cold. A sign of things to come, perhaps? Being almost first on the ferry, I was quickly off it and headed to Loch Na Keal first, to grab a first view of a white-tailed eagle. Or so I thought. 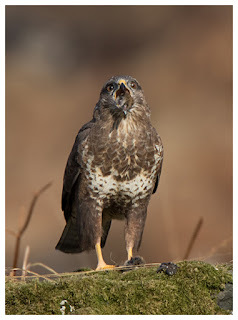 Was very quiet at the usual site, with just buzzards and hooded crows around. Was calm and warm though, and after a while I saw a distant golden eagle soaring over the hills behind, and that tempted me to head around the coast for a look. No sign, but I did notice a number of thrushes around, something that became a theme during the week. 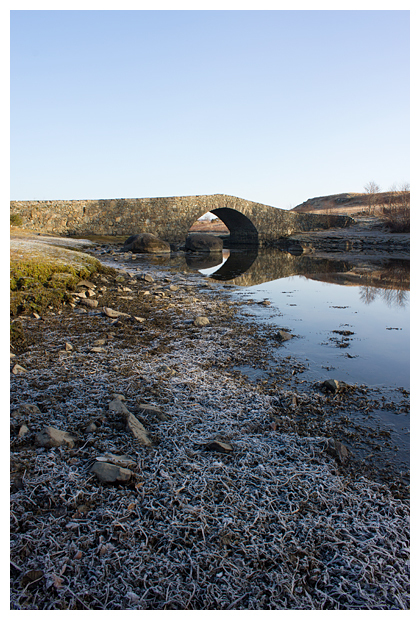 The first morning on Mull was glorious. 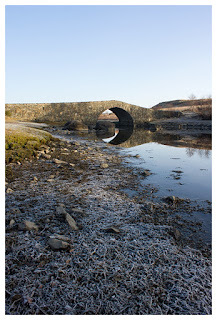 Calm and frosty, and I had decided to head south (just to see Scridain really) to have a quick look, before heading north. Stopping on the road to Grasspoint, I had to dig out the kit lens and capture the breathtaking views to be had. Quite often, when I normally head to Mull late summer, if the weather is fine, I end up taking lots of scenic shots and seeing little of the wildlife. I wondered if this would be the case now, early in the year. 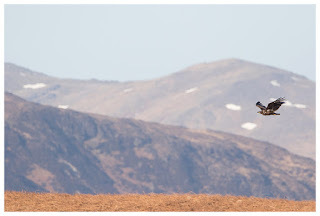 However, whilst looking at the view I spotted something rather large come in to land on some moors, and after a brief pause, it took off again, and powered off towards the coast. 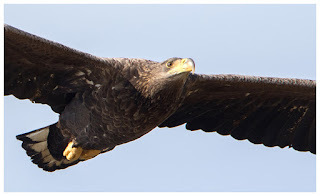 A juvenile white-tailed eagle! 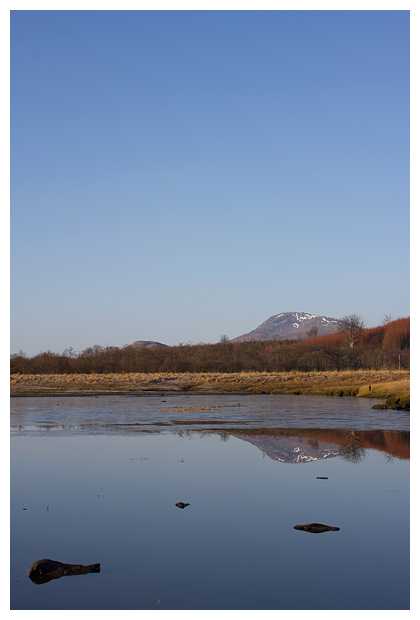 On arrival at Loch Scridain, I quickly scanned the waters which were calm and sparkling with the morning sunshine. Then I saw a ripple which broke into an otter. Fabulous. 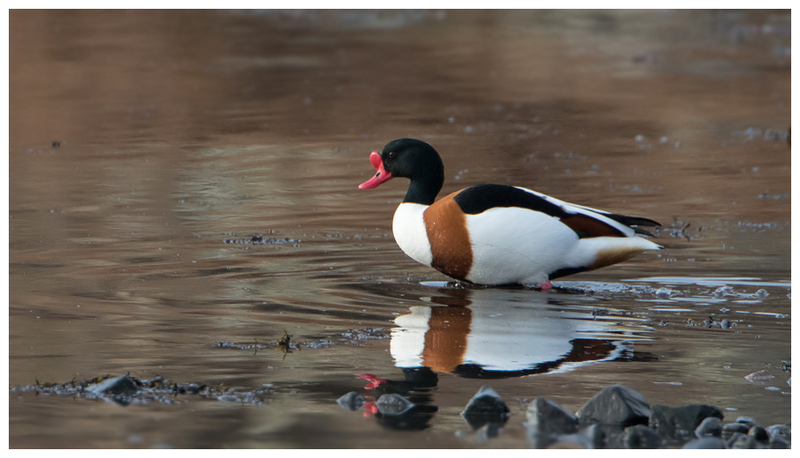 Munching away on a snack, something plentiful in the loch all year round it appears. 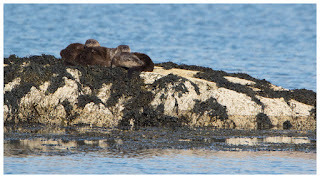 Moving in for a closer look, I quickly realised that I'd struck gold, and in actual fact, there were 3 otters here. Wonderful. With it being so quiet, I was afraid the shutter on the camera would alert them to me being there, so engaged the silent mode on the new Canon 7D2 and was relieved when they didn't hear it. 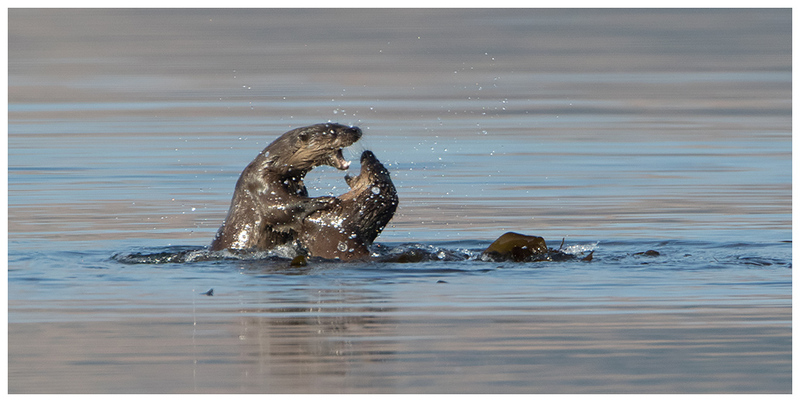 There was a mother and 2 youngsters, both of which seemed quite capable of catching their own food. 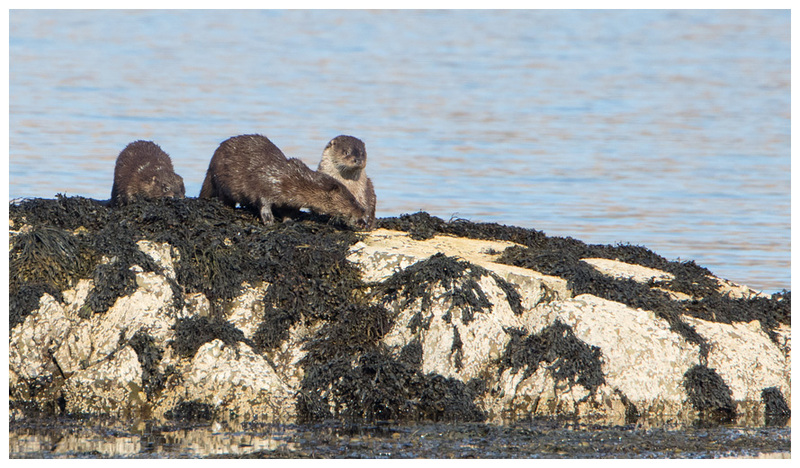 Though they happily accepted grooming from their mum as they sat on the rocks. 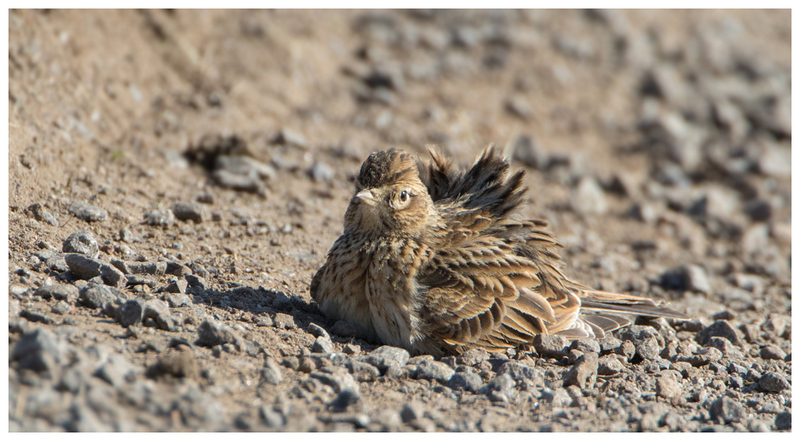 I found myself simply watching their antics, whilst being surprisingly warm for a day in March. They certainly looked relaxed. 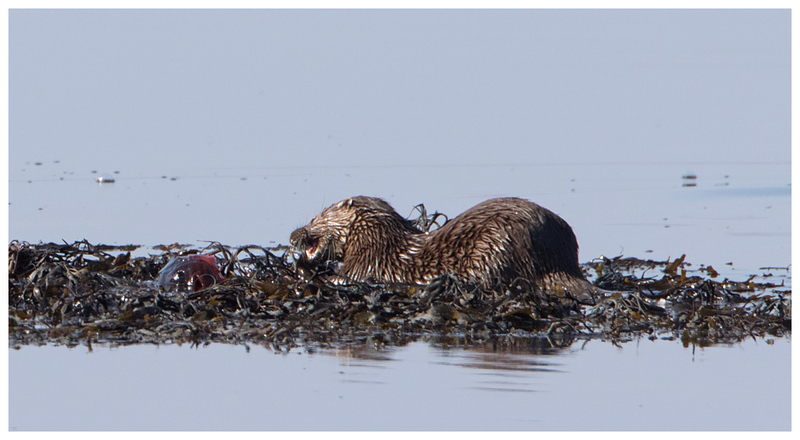 Mostly they would eat the catch in the water, but larger prey were brought ashore. Occasionally the mother would bring something to the rocks for the young, perhaps out of habit, as the young otters were catching plenty themselves. They still took advantage of the free meal. 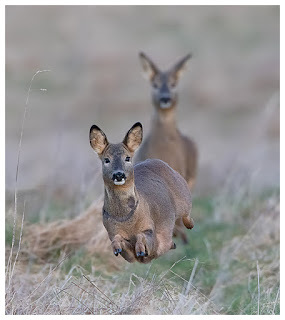 They were a joy to watch as they combined hunting with play. Bursting up out of the water and diving back in, catching food and happily munching away before diving for the next meal. As the tide came in, places for them to sit out on started to vanish beneath the water and they swam as a family group, over to the other side, away from the road and from me, perched in a rock pool beside the loch. A wonderful start to the break and good reason to abandon plans of exploring the northern end! 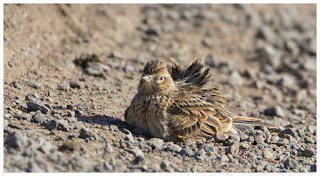 Travelling further south, I encountered decent sized flocks of skylarks, both singing and making use of the dry conditions to take dust baths at the roadside. 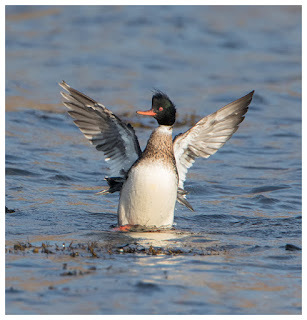 Whilst scanning the waters of the lochs, I noted that there were plenty of mergansers around, including the males which are a rarity when I visit Mull late summer. 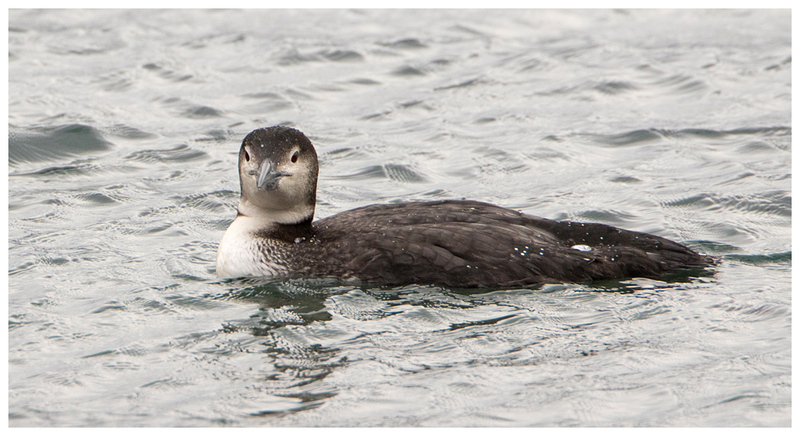 And, divers were plentiful too; great-northern divers in this case, albeit in their winter plumage. 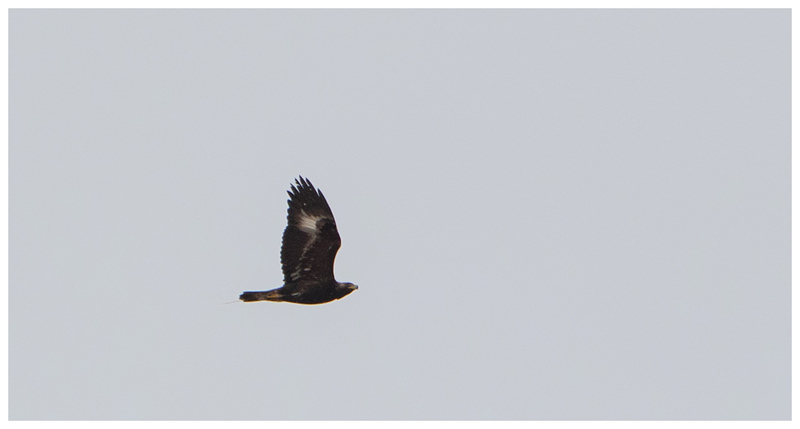 And using the eyes in the top of my head (you need several pairs on Mull) I clocked a goldie soaring on the thermals. My first day ended close to where it started. 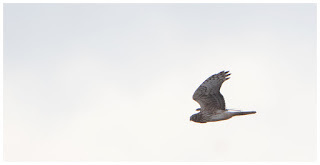 You see, when I was watching the perched WTE earlier, I spotted a ringtail hen harrier swoop in behind it, so I tried the same site for dusk and was rewarded with distant views of a pair of hen harriers, dancing over the moors together. 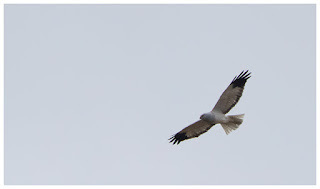 Alas a bit too far for pics, but I felt privileged to just be able to observe. A sad reminder though, that one shouldn't have to travel to somewhere like Mull to see this; it should be a sight on many moors across the UK. An early start the next day, I stopped a couple of times on my way to hopefully catch up with the otters, to photograph stags on the moors and marshes. 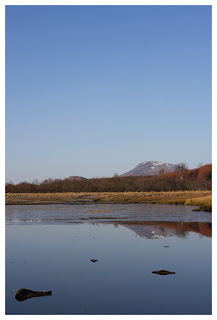 Another calm day - most unusual for Mull in my experience. Maybe March trips should be considered in the future! 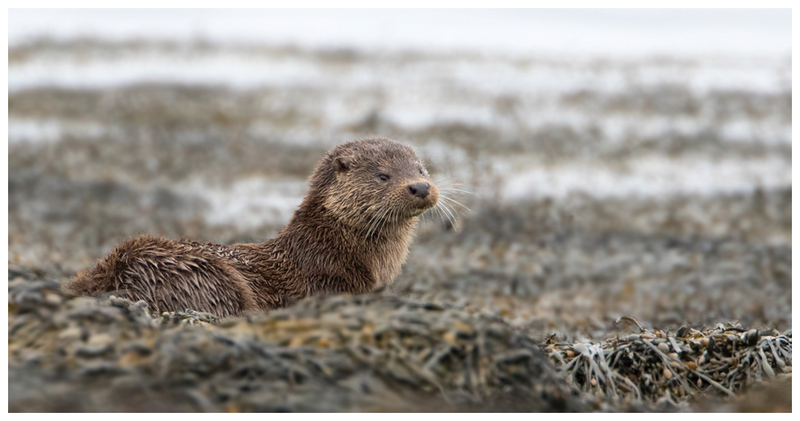 Reminding me that nothing is a certainty in wildlife, I found only one otter that morning. And it stayed in the shade of the hills behind before heading off and away from me. 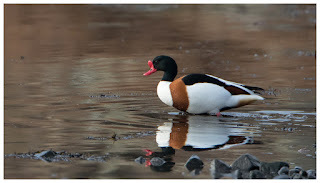 Driving around the loch, I spotted another one, but it was being photographed already and I didn't want to risk spooking it and upsetting the tog, so stayed at a distance. Perhaps a wise move as whilst scanning the hills nearby I saw a huge shape heading towards me. A juvenile white-tailed eagle, flying along the trees and right at me! 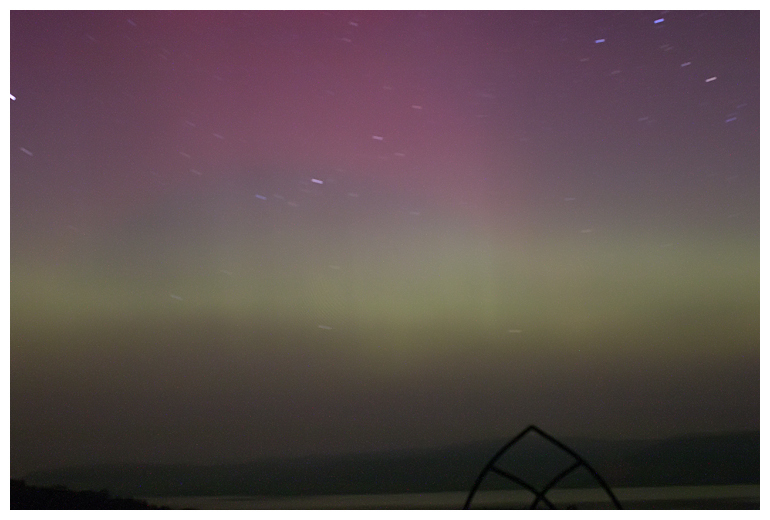 It completely filled the viewfinder and I struggled to fit it in the shot as it passed overhead. 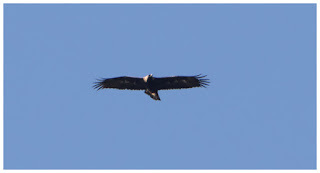 An impossible task when it flies so close, but what a treat! 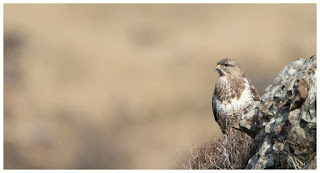 As usual, perched on rocks around the loch hillsides were buzzards and as usual I took advantage before they flew away. They might be overlooked here in favour of the eagles, but I still love taking their picture, and they make for great subjects. 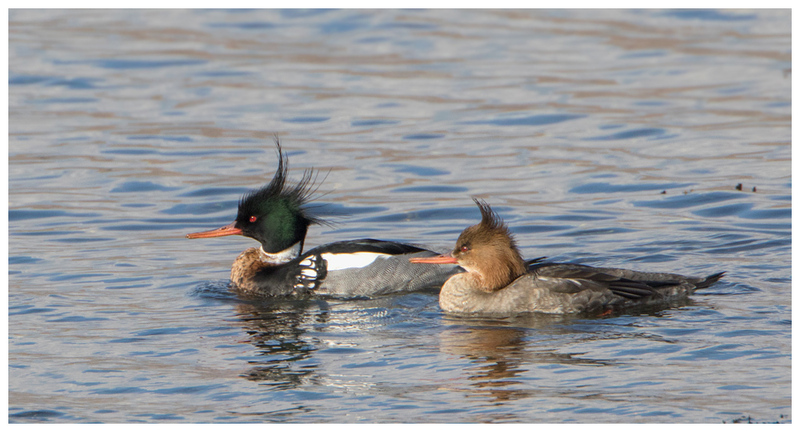 As do the mergansers, especially when paired up and close to the shore. 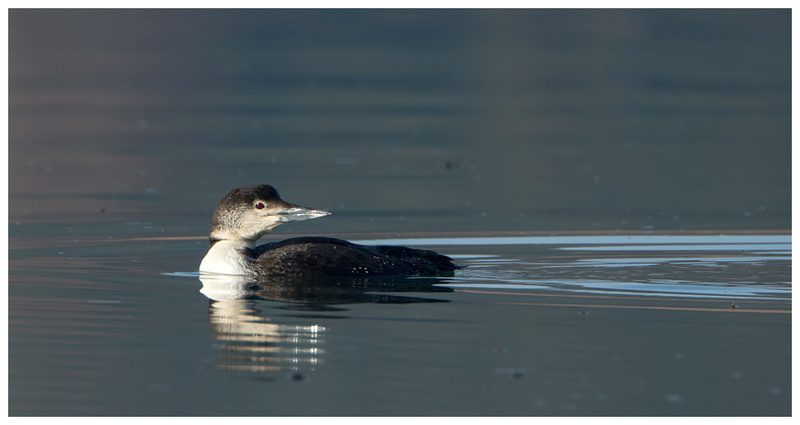 They were floating around in pairs among groups of half a dozen or so, occasionally bickering, but mainly preening. 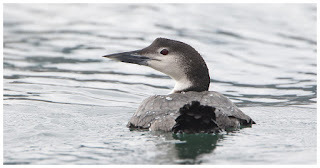 Further along the road I saw a great-northern diver close to the shore, so scuttled down to the edge of the water and lay, hoping for a close view. And boy did I get one, when it surfaced right next to me. It didn't seem bothered by me (if it could see me past the lens) and continued to fish in the area beside where I lay. 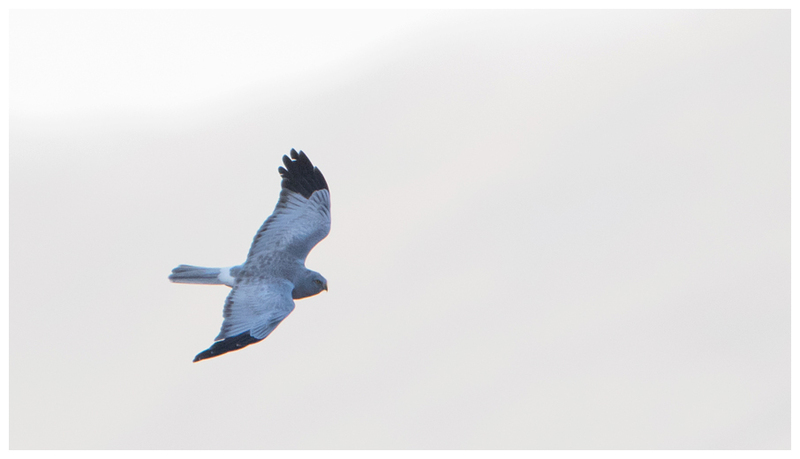 By now it had become cloudier and as I drove through the glen back towards where I'd seen the harriers before, a flash of white, grey and black between the trees had me braking sharply. A male hen harrier, circling the trees. 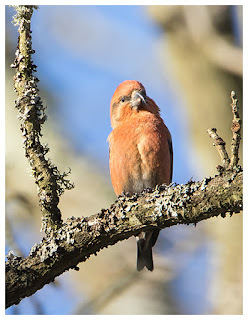 Only glimpses of it, but I had enough time to grab some record shots at least, which were the first I'd taken of a male for years. Great looking raptors, but usually like ghosts later in the year. I followed it along the glen for a mile or so, but it was getting more and more distant, eventually vanishing completely over the hills. 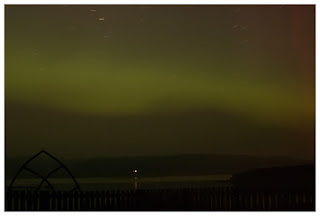 After the early start for the otters, I had intended to get an early night in, until I heard on the news of the Northern Lights being visible. I had to wait until late (or early morning) to finally see them as the clouds parted, and enjoyed fine views for a while. 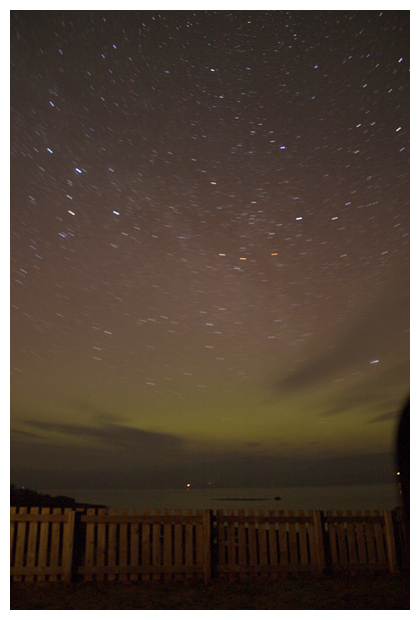 Just a shame the internet access at the cottage was down, as I didn't really know how to photo them properly, and the long exposures didn't quite yield what I wanted. Still, they were amazing to watch. 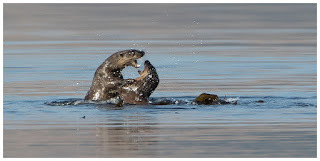 Trying again for the otters, initially saw me give up and head over to Carsaig, where I was amused to see a common seal breach the water like a dolphin, before dragging itself ashore. With cloud coming over, I returned up the hill. If only I'd been there moments earlier! A golden eagle was soaring up from the ravine, and by the time I had parked safely and pointed the camera at it, was already a bit high up. Back at the loch and my fortunes changed, when I saw three heads peering out of the glass-like water at a noisy truck passing by. 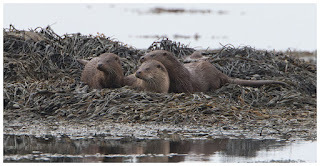 The heads became otters when they clambered out on to a rock nearby, again curious of the sound of a thundering HGV heading around the lochside road. 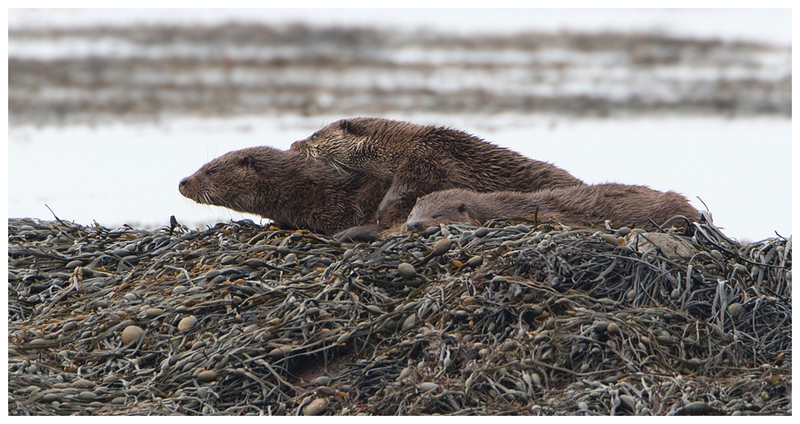 As before, the family group seemed very relaxed and took time to groom and roll around in the seaweed. 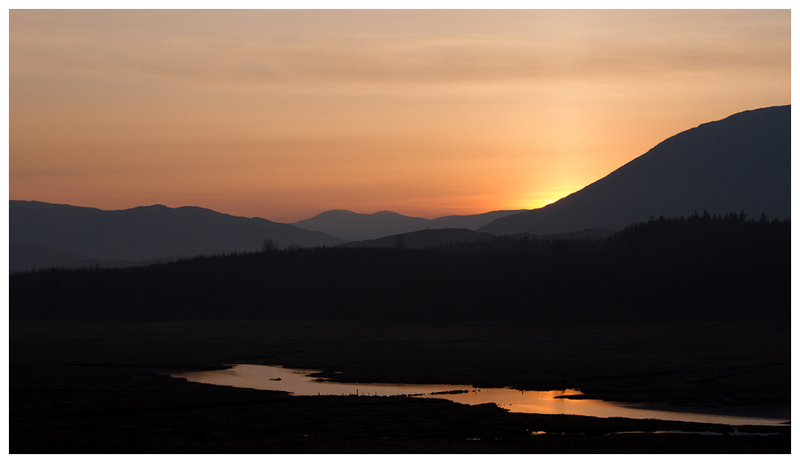 The light wasn't as vibrant as it had been before, but the scene was still magical to watch and photograph. 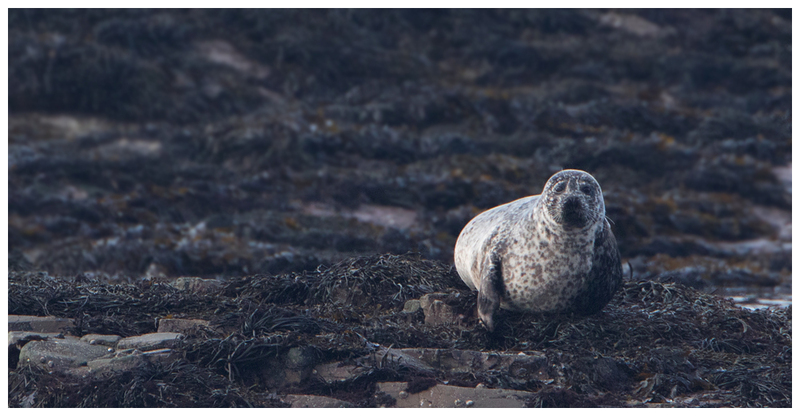 Moving between the exposed patches of seaweed-covered rocks, they caught bits to eat, rested, groomed and left spraints as they went. After they swam off, I tried to find the otter across the loch and sure enough it was resting in the same spot. A careful approach and I was soon crouched nearby, with a sliver of otter on display. Just a case of waiting and being ready when it moved. When he did appear, he seemed to be quite young as he had none of the scars or marks often seen on dog otters after they've defended territories, usually leaving marks on the nose of the otter. Or maybe he was just a skilled warrior. He certainly seemed at ease on the seaweed, and enjoyed rolling around in it for some time. 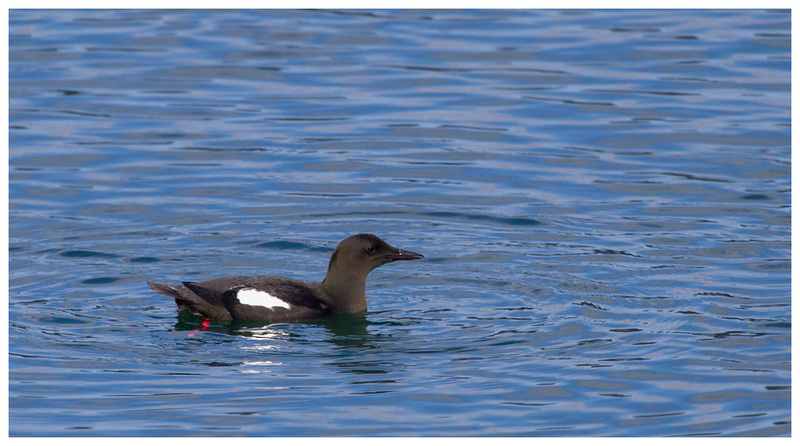 Eventually he headed back out to fish, and swam around the shoreline, vanishing into a gap between the rocks, where I couldn't follow. 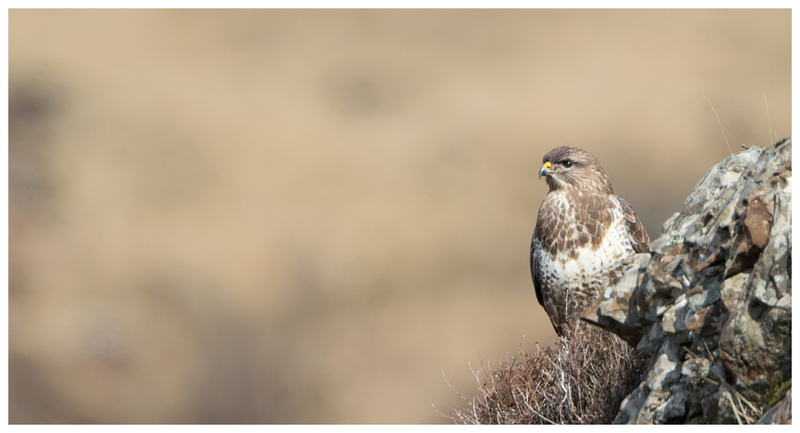 I toured around Loch Na Keal later, seeing curlews, more skylarks and buzzards, plus a lovely shelduck near the shore. 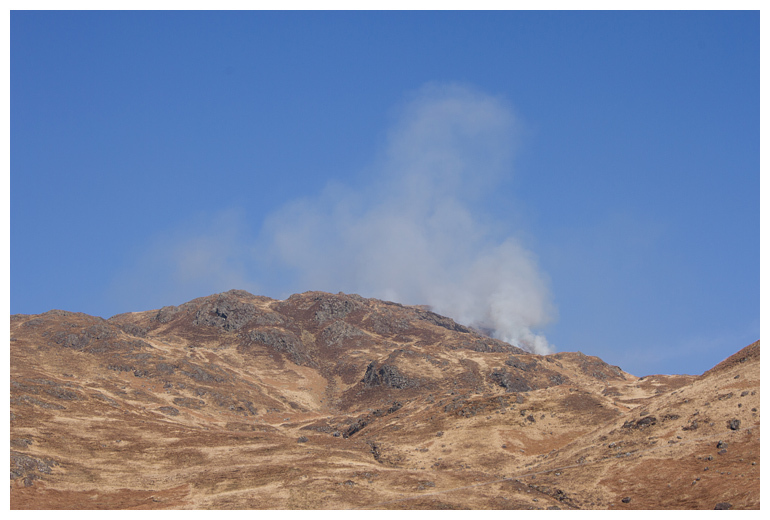 Another fine day on Mull. Bright sunshine greeted me the next morning, and as was becoming a theme, I headed south to see what was on display. 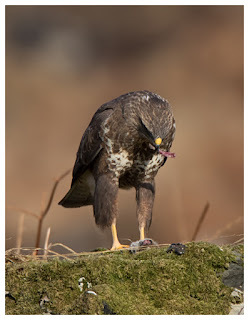 A buzzard burst from the shore with breakfast, and tore it to pieces in front of me. Again, fishing close to the shore was a great-northern diver, and I took a few additional shots against the darker coloured water. 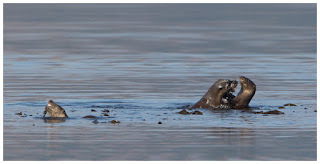 Then it was back over to the otters' site, at the turn of the tide. Better light, and again they provided more entertainment and interest. The youngsters were very playful, not only with each other, but with their prey. One had caught a large fish, and much like a cat does with a mouse, it kept the fish alive but in an area of seaweed where it could play with it, and not allow it to escape. Was intriguing to watch. 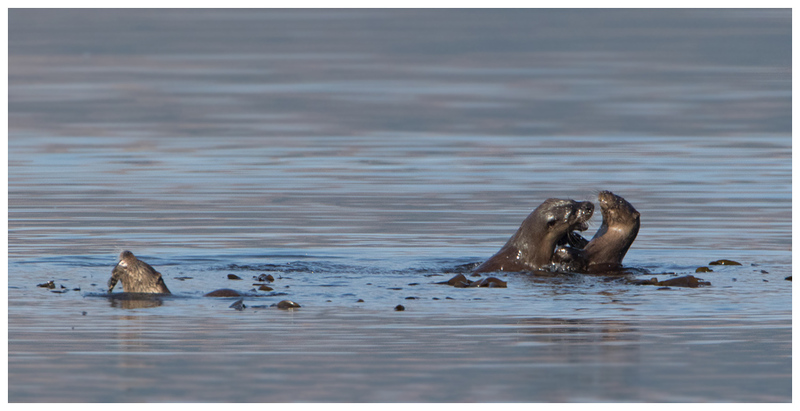 The otter would often leave it to go catch something else to eat, and then return for another play. And while the youngsters played, mum kept close by feeding herself. Later in the day, I was pleased to see a gorgeous male merlin perched on a hillside, but it flew off before I could get any closer. 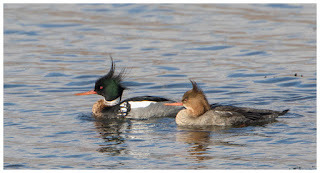 And more mergansers showed off in the lochs, usually preening beside the shore. Over near Lochbuie I was as surprised as the local fire crews at seeing a fire on the top of one of the hills. I got out of the way and grabbed a shot from the village. 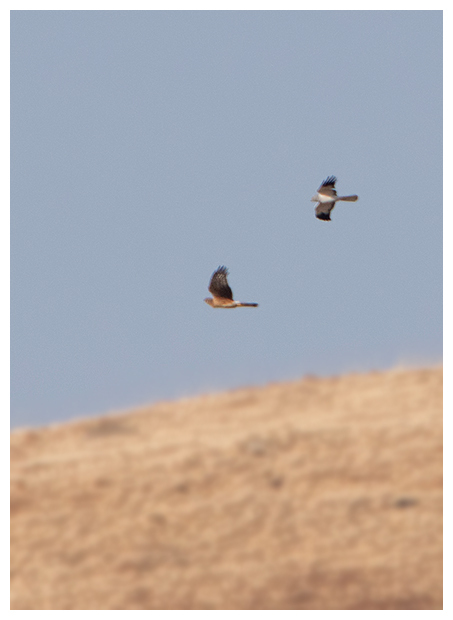 Back to the moors for late afternoon and again I was treated to views of a pair of hen harriers, as they performed their sky dance in the sunshine. And as I watched, I realised that the moor was alive with raptors. 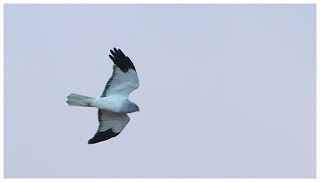 By dusk I had seen maybe a dozen hen harriers, a pair of buzzards, a short-eared owl and a golden eagle, all in the same area. What a sight that was. The weather I normally associate with Mull reminded me that it was still late winter, and I had a quite quiet day. 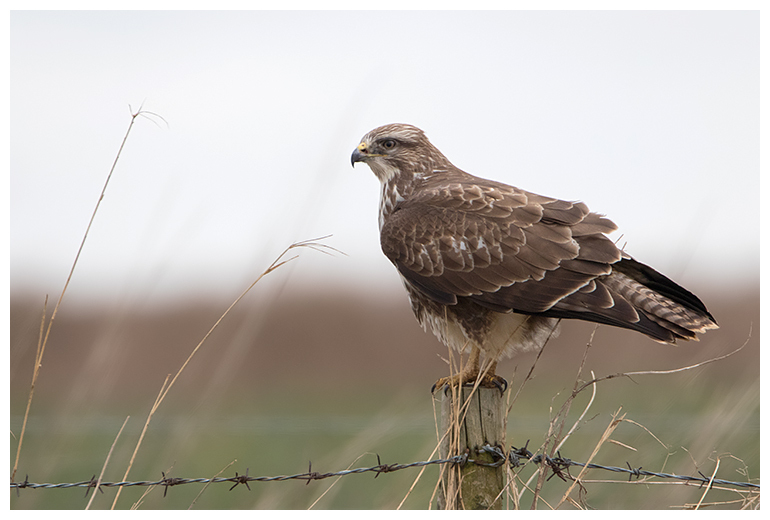 Stonechats and curlews became subjects, and a late encounter with a male hen harrier raised a smile. 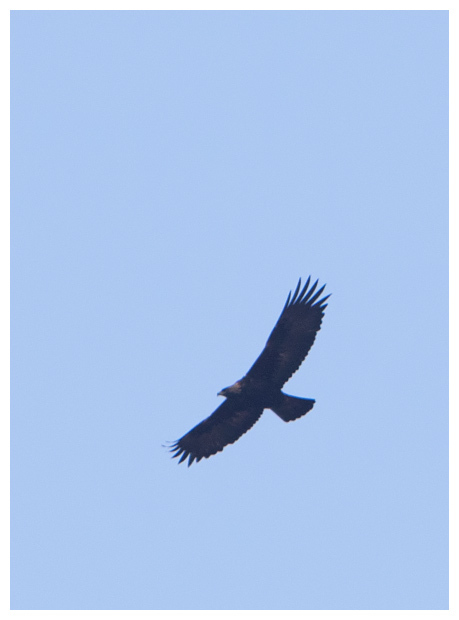 Mainly of slight annoyance, as it flew over a place I'd been parked moments earlier. And the much awaited eclipse was alas hidden by dark rain clouds. In fact, I thought it was just getting dark for another downpour, when it actually happened. 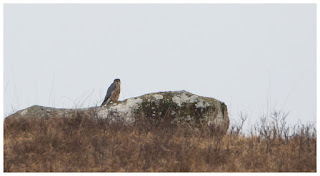 My final full day started with me trying to get close to the merlin. It was an impossible task as the hillsides were a combination of squelchy sphagnum mosses and crunching heather. It just flew further off each time, and as I headed back down, I was a little peeved to see a golden eagle pass over where I'd just walked away from. Typical! 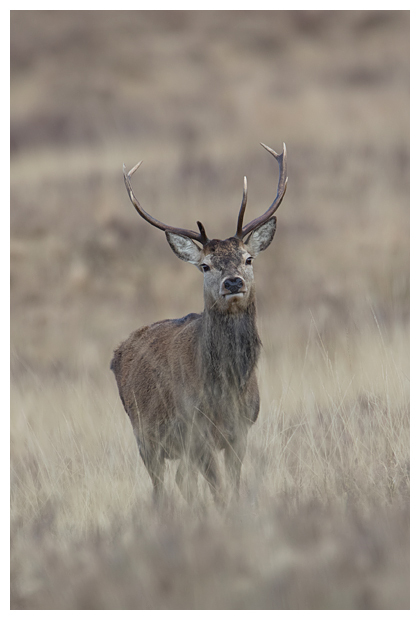 With plenty of stags roaming the hills, I found one sat in the long grass and took some shots as it watched the traffic occasionally pass by. A raft of razorbills drifted by in the centre of the loch and more mergansers and divers fed around the edges. With it being my last day, I chose to spend more time at the hen harrier area of moors, hoping for a change of luck. I had a bit of a wait, but when one popped up, so did the others, and it was a case of waiting and hoping. Finally a male flew a bit closer to me, and I gleefully grabbed some shots. Moments later, a female headed over, and provided more images to take. Before another male hen harrier floated by. I stayed till it was dark, enjoying seeing so many of these normally elusive birds displaying and hunting over the moors. 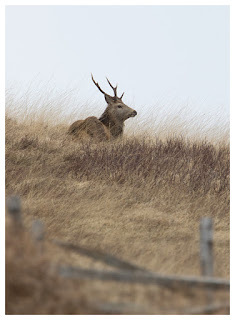 And so concluded another marvellous week on Mull. 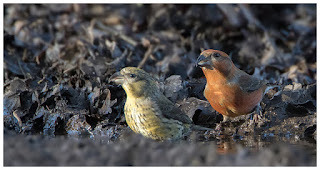 With the Cotswolds providing me with a much needed fix for short-eared owl action, I have taken the chance to look around the area a bit more, and capture other wildlife too. 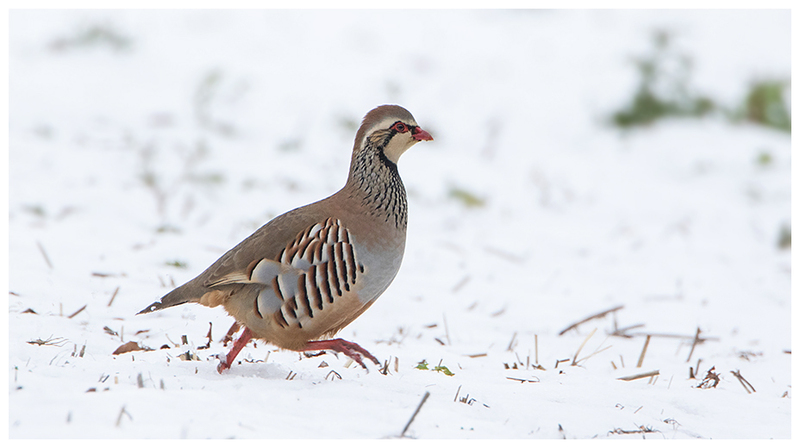 With shooting being such a popular "sport" around there, the fields are full of partridges and pheasants. The red-legged partridges are comical characters, with the way they hop over walls, sit and absorb the sun's warmth or turn tail and scuttle along at an amazing rate, when alarmed. 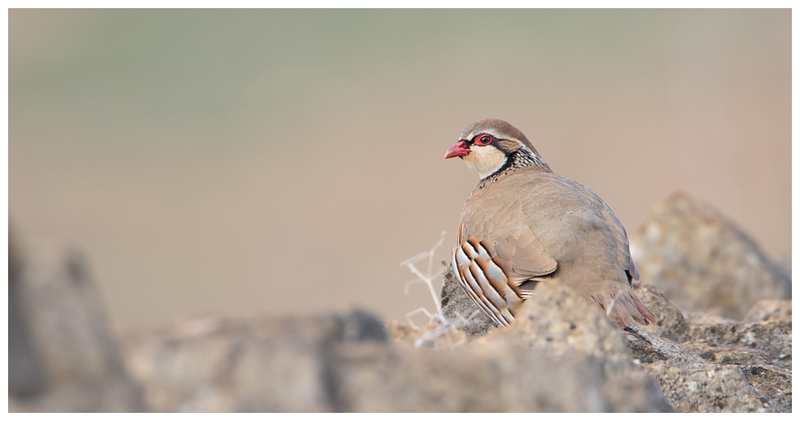 While images of them in fields are lovely, I have to say trying for shots of them on the Cotswolds stone walls is my favourite challenge, and isn't always easy. The birds are easily scared (not surprising when they're being shot at) and getting them on a wall, with the light just right can be a game of patience or pure fortune. Same with the local buzzards, which seem to have a habit of flying off just as the lens locks on, though this one stayed put to show its appreciation of my photography, moments after this shot, decorating the surrounding grass with something rather unpleasant. Encouraging to see are the amount of kestrels around too, often seen sat on posts, lines or hedges, watching for movement below, to swoop down upon. There appears to be good numbers of brown hare around here too, but I will need to be up far earlier to catch them in action. The one day I did manage to arrive for dawn, the hares decided to have a lie in! None to be seen anywhere. I did get some lovely shots of roe deer at dusk, which sort of made up for it. The county I have focused on here, so far is Gloucestershire, and I am barely scratching the surface of what is on offer. Heading west, I have also spent a few days in the Forest Of Dean. The boar have managed to evade me thus far (aside from one huge male some years back), but I have enjoyed some success with birds around there. Hawfinches breed in this area and at this time of year can be seen feeding both in trees and on the ground. Yew trees are a favourite of theirs, so it can be a case of locating some and hoping, though local bird news sites can help narrow down possible sites. Finding them is one thing, photographing them, or at least getting the chance to is something else. 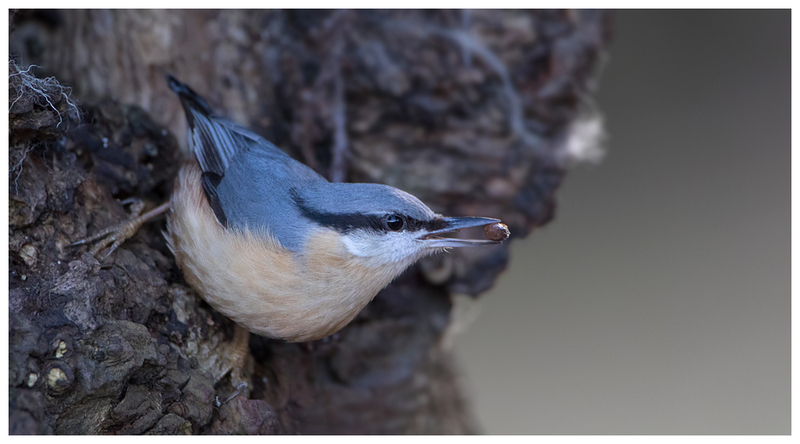 They are shy and tend to stick to the shadows beneath the tree, and seem to be the last to come down to feed, and the first to fly off at the first sign or sound of trouble. 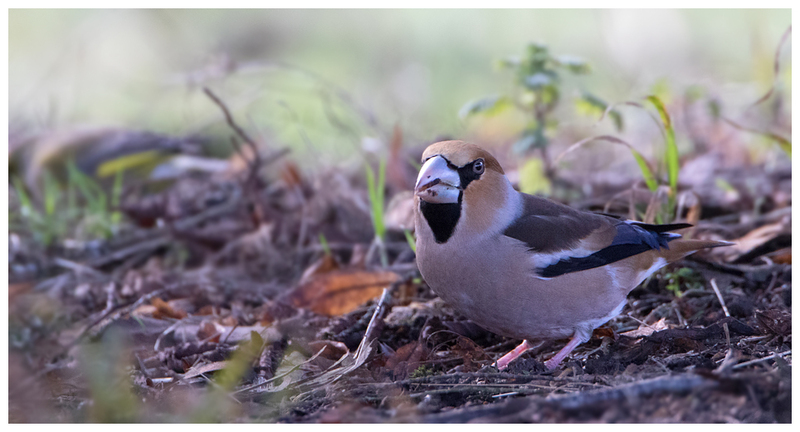 As such, when Joe Public or the local sheep aren't scaring them off, I have found that the silent mode of my new Canon 7D Mk2 has been a benefit, allowing me to shoot away and not frighten the birds with what resembles a machine gun. Even then, they have an amazing ability to land with something in front of them, be it a strand of grass, a twig or be facing the wrong way. Stick at it though, and eventually some half-decent images can be had. Whilst waiting, there are other species to be captured. 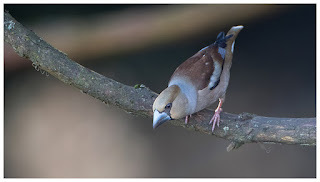 There are numerous nuthatches around, constantly calling to each other and feeding on seed thrown down by folks probably keen on seeing the hawfinches! 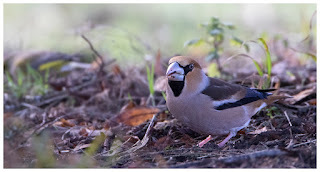 And another shy bird can be seen making the most of free food, sneaking in when the magpies and crows aren't looking, to make off with a meal. Jays. Then there are the flocks of crossbills. 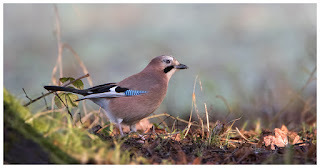 I have on many occasions visited the Wyre Forest for these, but never really had much luck. I even travelled up to Nottinghamshire once, to see the "guaranteed" flock that were drinking from a puddle daily. Except when I went, when they didn't show. So when I heard of some doing similar in the Forest Of Dean, I thought I'd have another go. 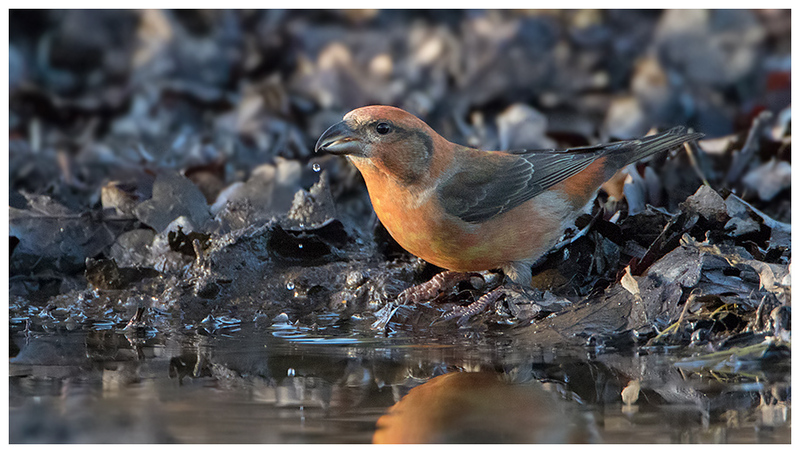 This time, I was luckier, and enjoyed some fabulous views of a male and female drinking from a small puddle. They are such vibrant birds, even managing to glow somewhat when in the shade of a tree. But in the sunlight, they shine. 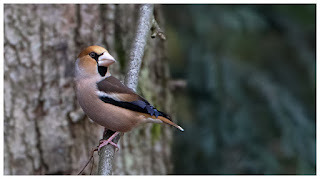 Lovely birds. With Spring around the corner, I will probably be distracted with other targets soon, so will be heading to other counties, though the lure and chance of seeing some boar might keep me going back. 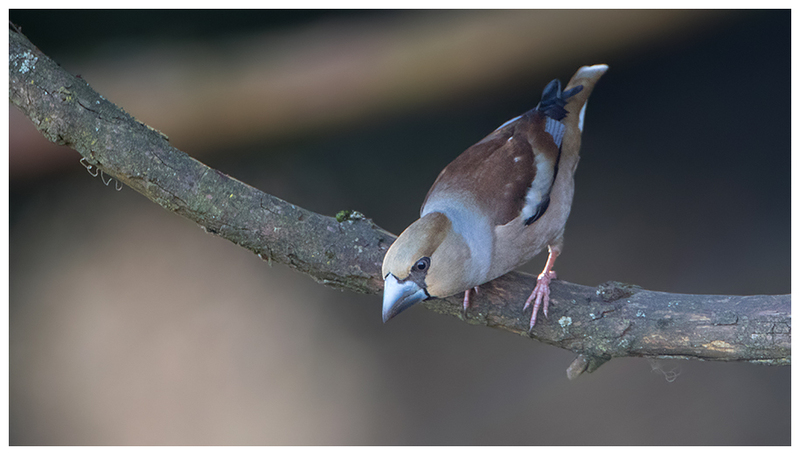 The hawfinches will soon vanish into the canopy and I haven't been to see the short-eared owls for a few weeks now. 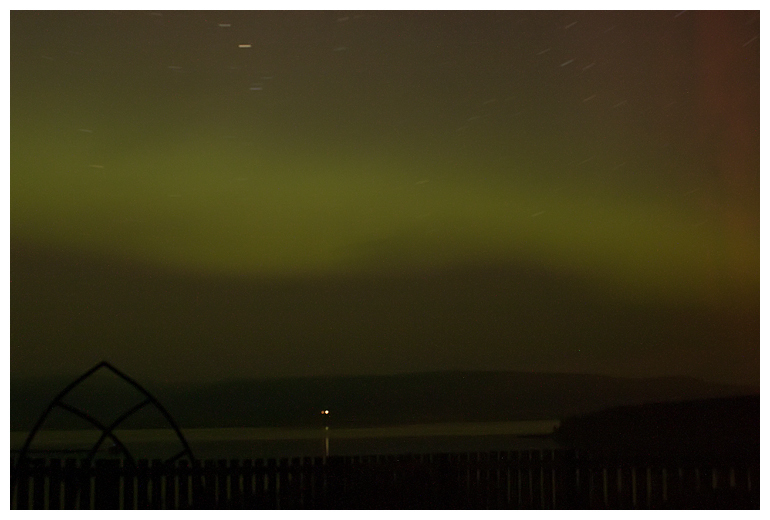 That said, I still have a mountain of unprocessed images of them to sort. So expect to see more on my Flickr stream for weeks to come.